It was really nice to focus on this palette this month and really get to know the shades. Of course, it’s an amazing palette. Check out my review and swatches if you want to learn more about this palette, and I’ll be posting a look with it soon! Speaking of ELF blushes being pigmented, enter the brightest pink blush you can get. I normally wouldn’t get such a crazy blush, but since these are so cheap I decided to go for it. For $3 you get a very pigmented powder, and they have a lot of shades. I definitely recommend checking these out! I used this a few times this month, and these shadows are just as buttery and pigmented as I remembered. But, I did make a discovery: these shadows go on even more pigmented and without any fallout when you use your finger. I know that’s not the most sanitary application (wash your hands first! ), but I forgot my eyeshadow brushes when I went to my boyfriend’s one day and decided to throw some on with my finger, and I was really pleased. I can’t wait to get more use out of this palette as well as the three trios I own! 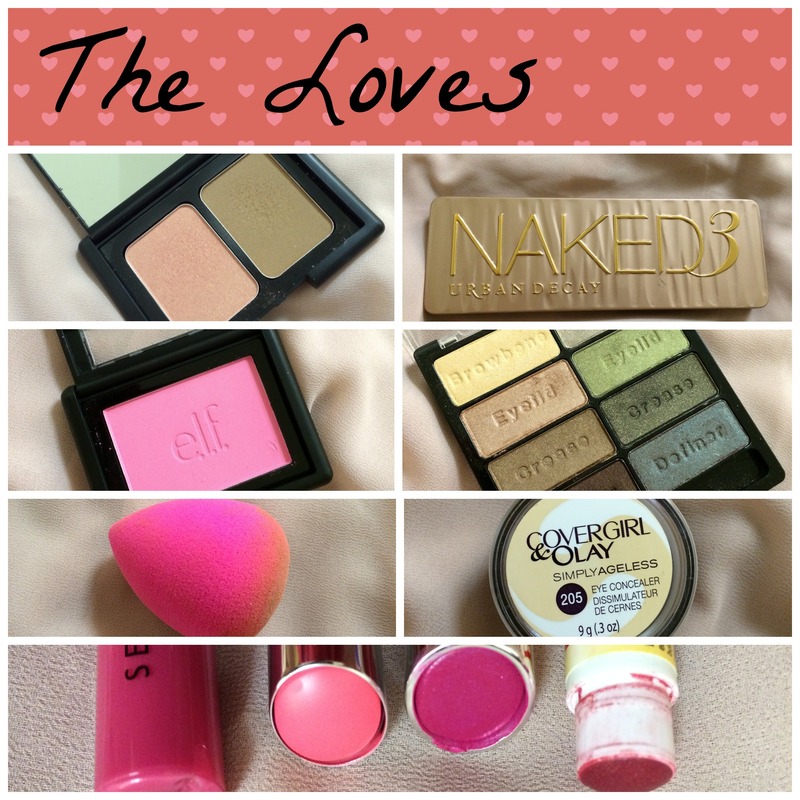 I realized as I put the “loves” collage into this post that I forgot to include the Beauty Blender in my original basket post, yet put it in the basket with the other products. Yeesh. Anyway, I really do love the finish this sponge gives, and it makes my foundation much more even all around. My only qualms are that the sponge stains yet when I clean it the dye washes out more than the makeup, and that it is quite expensive. I’m looking into trying out some dupes, so fingers crossed I’ll get the same results from something cheaper! 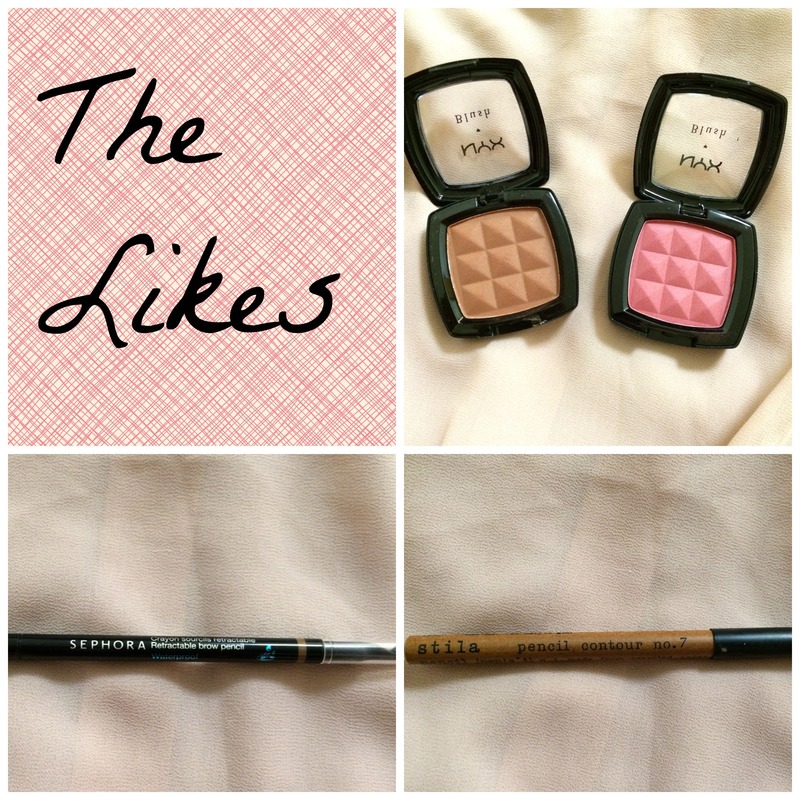 This concealer is discontinued, but I wanted to get more use out of it and these posts are a great way to do it. I really like the texture of this concealer, even though I bought it a shade too light. It feels very thin and goes on very pigmented when you just tap it on with your finger. I really like it, but I feel bad reviewing a product that you can’t get. Sorry! I very much enjoyed wearing my pinks this past month! These are all beautiful lip colors, and they certainly cheered me up during the polar vortex, part 2 and 3 (I missed part one back in early January, lucky me). The only reason these aren’t in my “loves” is that I didn’t really get more excited to use them, and went for other blushes first. Out of the two, I surprisingly gravitated more towards Mocha, which shows up as a kind of muddy red on the cheeks. It is a nice subtle color that works well for winter. Desert Rose is beautiful, too, but I didn’t use it as much as Mocha. These blushes are a really good quality and certainly worth looking at if you come across them. This pencil is pretty good, but this is just the wrong shade for me. It was much too orange and too dark. I can’t believe I used to use this! But as for the quality of the product, it is a nice pencil and very pigmented, and it lasts all day for sure. I didn’t test the waterproof claim. The texture is a bit funny, I feel like I have to press pretty hard and use more strokes to get the look I want than with even my drugstore brow pencil, so personally I don’t think it’s worth the price. This is a pretty nice eyeliner. It’s a beautiful color and lasts all day, but it does drag a little putting it on. I’ve used smoother liners from the drugstore, so I don’t think I’d ever repurchase this, but I did enjoy using it this month and I know I’ll be going back to it as the weather warms up. I tried this foundation once early in the month and it looked awful. It was patchy and made my skin look dry and flaky, even though I have oily/combination skin! I thought that the extremely cold weather might have played a part, so during the brief warm spell near the end of the month I tried it again, but it looked just as awful. I’ve learned my lesson: don’t be cheap on foundations. IMPORTANT ANNOUNCEMENT: I won’t be doing a March basket because I’ve gotten a lot of new makeup lately and want to focus on getting out some more product reviews. This series is about using up my makeup, which includes the new! Thanks for reading! Have you tried any of these products? 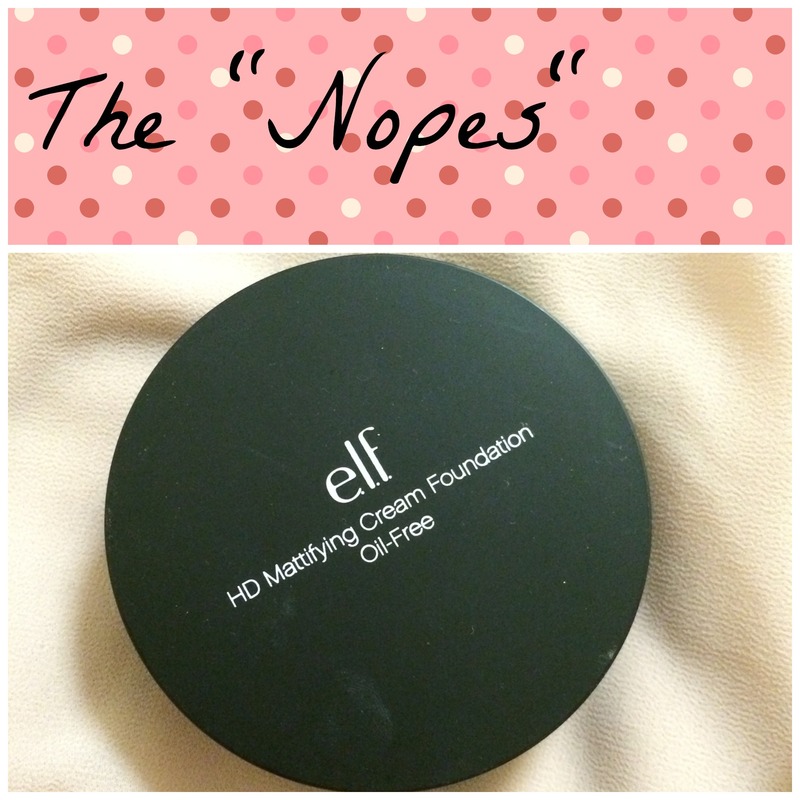 ELF is having 50% off right now through 3/3…so that bronzer would only be $1.50!